It's All About the Props! Do you use yoga props? We look at different props, how we use them, and how they help you grow in more ways than one..
There’s a much misled (ego-driven) view when it comes to yoga props, they’re often seen by students as a tool for the weak and inflexible. Yes they’re great for beginners who lack the flexibility and strength to get themselves into and hold certain poses, but yoga props are so important in our practice no matter where we’re at with it. There’s this important principle in yoga called Ahimsa, which basically translates as compassion for others and for ourselves. We practice Ahimsa when we practice yoga by removing the ego, concentrating on the integrity of the poses, and ensuring we take care of our body. Yoga props help us do this. It’s all about self-love, so leave your ego at the door, grab a couple of blocks and allow yourself to grow. BOLSTER – Here’s one you probably wouldn’t want to use in a hot yoga studio (sweat!) but if you have a home practice, a bolster is a great prop to use. Place it vertically along your spine and allow yourself to melt over it for a gentle chest and shoulder opener, place it under your knees in savasana, and place it against the wall to elevate your tailbone for a comfortable legs up the wall pose. A bolster brings that extra level of comfort and self-care to your yoga practice. BLOCKS – Probably the most common yoga prop and one that you’ve likely used in class. For beginners, blocks can facilitate reaching into a pose when the flexibility isn’t quite there yet. For those with a more developed practice, blocks allow us to find more integrity in so many poses. Sit on them to elevate your hips above your knees for pranayama exercises, lie over them for supported fish, squeeze them between your thighs to create a perfect bridge pose, use them to give yourself extra reach in the ever-tricky revolved triangle…. the possibilities are endless! Look for cork blocks, which are made of natural material, and are supportive yet comfortable. 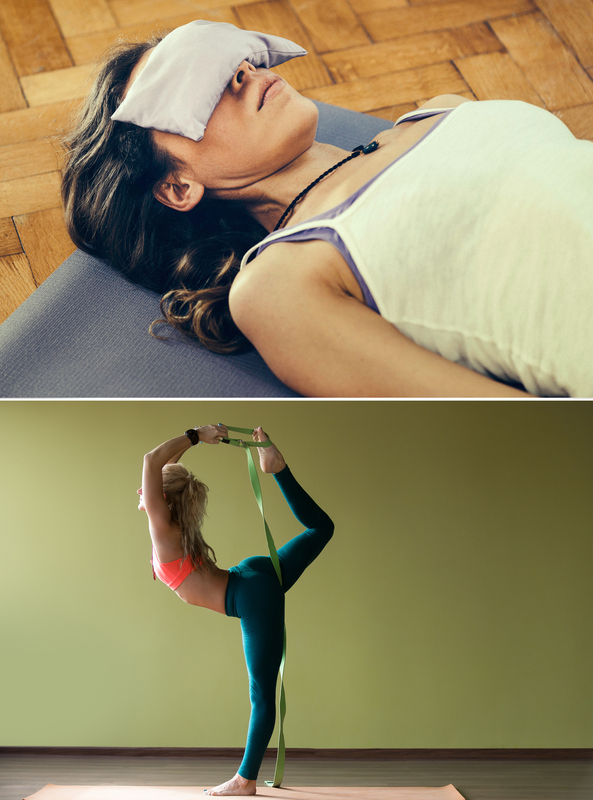 EYE PILLOW – Again one you are unlikely to have come across in a hot studio, but eye pillows are amazing at taking your savasana to the next level. Slightly weighted (usually filled with rice or beans) and sometimes infused with lavender, the eye pillow assists with grounding mind and thoughts as you allow yourself the proper rest your body needs and deserves at the end of practice. Look for an eye pillow made from silky satin or velvet for that extra bit of luxury. STRAP – Get support while you stretch tight areas with a yoga strap. These are great for hamstring stretches, tight shoulders, supporting us in lateral stretches, and allowing us to try standing poses in a safe manner when they might not otherwise be accessible (think dancers pose, extended hand-to-big-toe). TUNE UP BALLS – These small rubber therapy balls can provide release from deep tension within your body. Use them for self massage to get in deep through layers of skin and muscle and help with injury or tight spots like frozen shoulder, sciatica and back pain, tight hips and hamstrings and more. If you haven’t already, try one of our ‘Yoga Tune Up’ classes with Peter Lavictoire, where he guides you through different ways to practice self-massage with tune up balls. It’s the perfect compliment to your regular asana practice, and a really great way to take time out to practice self-care. We sell a range of yoga props in all of our studios (Westboro has the largest selection). If you have any questions about props or wish to purchase any for your practice, the desk staff or your yoga teacher will be happy to help.